At the end of the last month we reported about leaked Christmas-themed camo for the weapon from Call of Duty: Ghosts, and it seems that this information was completely legit. Yesterday the developers announced Festive Personalization Pack that is coming for free for all shooter's fans. To make the upcoming holidays as pleasant as possible, Infinity Ward is going to present all gamers a free content pack that will bring the spirit of Christmas to your Call of Duty: Ghosts. 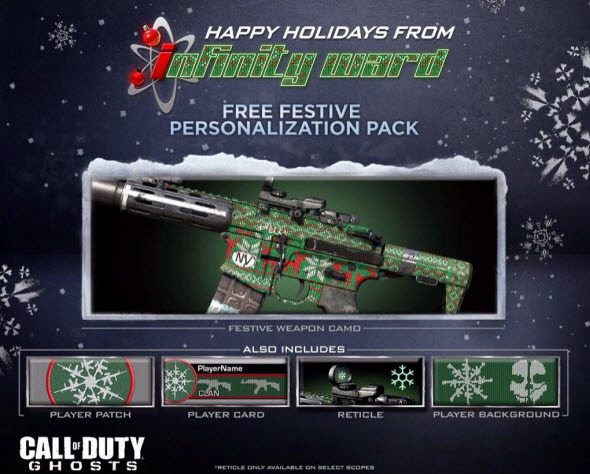 Festive Personalization Pack consists of the weapon camo, player patch, background, card and reticle. Using the camo, you will be able to transform your AK-12 into pretty and warm something that looks like the sweater created by your grandmother. The other items from the pack are also full of festive mood. The card, patch and background include beautiful snowflakes, and again snowflake will be pictured on your reticle. If you like all this madness, then don't forget to download Festive Personalization Pack on the 12th of December for PC and Xbox 360 and on the 18th of December for the other platforms. All the more this pack is completely free.